When they decided to build on their creekside property, the owners of this sprawling Texas ranch made low maintenance high priority. From the floors to the ceilings, every detail of the home was selected for its natural look and finished, or unfinished as the case may be, to weather and mellow over time. Even the flooring fits the no-maintenance prerequisite. 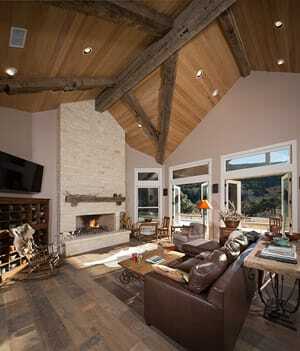 And the laid-back, Hill Country vibe. 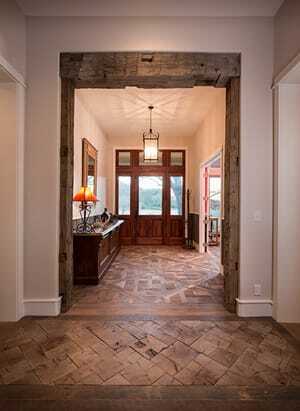 Wherever possible, the owners chose to finish their home with materials native to the central Texas landscape. The home’s exterior features limestone. Inside, native varieties of wood include mesquite, oak, and cypress, all of which grow abundantly in the area. 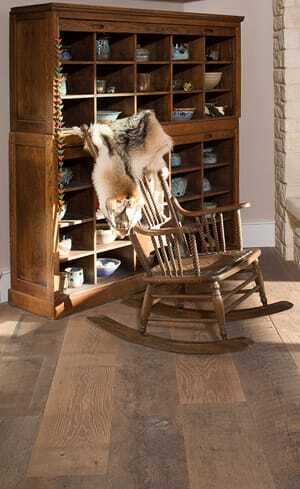 Flooring throughout the home is aged and weathered white oak, a hardwood that stands up to heavy traffic. All the floors are finished with European penetrating oil, a protection that is ideal for reclaimed flooring. The oil actually embeds into the pores of the wood so there’s no surface finish to maintain. Just sweep or vacuum and enjoy.